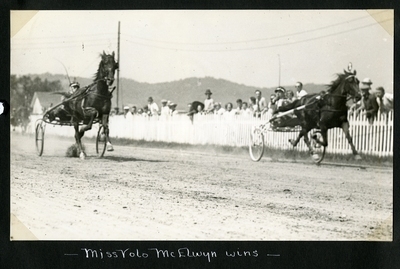 Black and white action photograph of brown mare, Miss Volo McElwyn wearing head number one (on right), M. Kay up, winning the third heat of the 2.17 Trot at the Cornish Early Meet on Thursday, June 30, 1938 at Cornish, Maine. Miss Volo McElwyn finished the heat in a time of 2.15. Bay gelding, Lottery, driven by J. Phalen, placed in second.